UPDATE: The West arm at Newhaven is closed and has a big gate with barbed wire at the front. The company that owns the port have also restricted access to the east arm as well. They have blocked the usual walkway that is used to get to the arm and allowed the hedge to overgrow which makes access really annoying. You can still get on the arm but i dont know how long this will be for as they seem to be adament on ruining these great spots for the public. Probably because of a small moron minority ruining it for the rest of us (I heard a rumour of kids throwing stones and casting at boats entering the port). You can still access the arm but it means getting through the deliberately unkept hedge and then walking slightly longer round (about an added 5-10 mins). 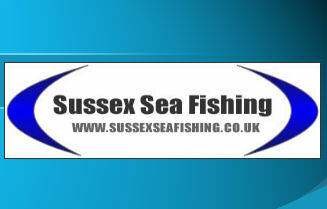 · A great spot in most weather conditions and offers similar variety of species to Brighton marina. · The east arm is good for fishing on a westerly wind as the sea is sheltered from the west arm so the water stays clear longer. · Float fishing using thin Mackerel strips can be deadly here for Mackerel and Garfish on size 4 hooks with some good sized fish being caught. · Is slightly more difficult to access since new port authorities bought the port as they have restricted access to certain areas. East Arm: More difficult to access but still fishable but for how long I dont know? This is a great location and probably my favorite all year round venue and highly under rated as it offers a variety of options all within close range. On the east side you are facing tide mills, the bottom here is sandy so snags are very few. On the west side you are able to fish into the deep waters of the river (picture below) that enters the port. The west side is usually a spot i fish when all other areas are to rough. I have caught Eels, pout, flounders, whiting, Bass and rockling from this side during rough weather. My favorite spot fishing a westerly wind is the newhaven east arm as the water is very calm and stays clearer than many other marks which allows you to float fish and catch mackerel and gars. I have fished this spot in a competition when Brighton marina had water splashing over it and nobody caught on floatfishing gear and were catching pouts etc whilst i chose to fish newhaven east arm and had quite a few Mackerel and gars. Summer: In summer this is one of my favorite local spots to fish as it offers consistent sport and a wide variety of fish in most weather conditions. It is a god spot when there is a slight breeze that makes other locations unfishable with the water often staying clearer here for longer then most marks. When float fishing on this arm in summer months you are always best fishing the east side of the arm as this is where the fish are. I have had Bass, Mackerel, Garfish, Shad and Scad all on float fishing tactics often using mackerel strips. you can fish the end of the arm however it can get full quickly. Another top spot on this arm for float fishing are on the double bays. You may wonder what these are so i will describe them as best i can. As you walk up the arm and look to the east you will see long concrete struts that come from the walkway but are fenced off. As you walk up the arm you will see bits where there are two of these struts together which makes them easier and safer to walk along. I will try adding a pic soon. if you set your gear up on the walkway and then walk along these double sections and sit on the end hours of fun can be had float fishing. Only go along them if you are confident of heights and with a friend, for saftey purposes i cant recommend that you fish there as there are many safer options but when i fished there it has always been productive on float gear and spinners only. If you are more into bottom fishing then i would fish at the end of the arm on the east side looking towards seaford, you will catch alot of flatfish with a 30 yard cast and some good sole on late summer evening tides. The best times for better catches are morning or evening tides but i have caught most species of fish throughout the day. You can catch a variety of fish from here with the weather conditions often dictating what you are more likely to catch. In spring and summer you will catch Mackerel and Garfish on the float. At the end of the arm you will catch wrasse, pout and pollack down the side, plus the occasional Bass. With a cast out you will catch flatfish of all varieties. There are also some good mullet to be caught down the side of the arm from the sore to the end with many anglers confusing them with Bass because they will occasionally chase up spinners or feathers (but they will never take them). You will often see them swimming in between the pier struts. If you want to target them check out the fish guide page. Winter: This mark has been one of the better marks over the winter period for 2006/2007 because it has remained fishable when most other areas have been too rough to fish. it benefits from the protection of the longer west arm and also due to its pier likle structure the waves braek through it rather than up against it like on Brighton Marina. There are distinct areas to fish with the end section providing the best all round sport. Casting towards seaford produces whiting, dabs, eels, pout and codling and there is a gully approx 90 yards out which can hold some good fish. casting towards tidemills also produces plenty of fish and is productive for flatfish such as flounders and dabs. Casting into the harbour produces similar catches and has seen some very good sized pout and whiting come out. Fishing straight out from the end of the arm produces similar catches as previously mentioned, however, be careful as about 20 yards out there is a muscle bed full of snags which you can lose alot of tackle on so if you fish here give it a good cast or fish close to the pier to avoid problems. Standard rigs such as 2 or 3 hook flappers/paternosters will provide good sport and size 2 hooks are a good all round size for catching most species. When the water is rough and dirty fresh lugworm and oily fish baits are effective. when it is slightly calmer and clearer ragworm baits produce catches as well. The only problem with this spot is that it is now very open to the wind with little shelter as the old lighthouse has been removed, but you could bunjee strap your umbrella to the side. I am going to try this spot alot more over the winter as you can fish into the beach at tidemills and also into the deep shipping channel that enters newhaven port. This should provide plenty of whiting and hopefully the chance of a codling. West Arm: Currently shut. However i have seen people fishing from the arm so im not sure if they are opening the gate or if they are just getting around the fences. Harbour Car Park: Still allowed to fish.Not sure how well it fishes as never realy tried it unless everywhere else was out of the question through rough weather, even then i would fish the Hope Inn as i have had more success there. If you do fish this spot you can catch a variety of fish with good Bass being caught. The best bit to fish is as near to the corner as possible. The only problem i encountered when i fished there was large numbers of crabs taking the bait so i would suggest pop up beads which keep the bait off the bottom or peeler crab baits. Inner Harbour opposite the Hope Inn: Still allowed to fish. This is a good winter spot that i use when most other spots are too rough to fish. It fishes pretty much the same as the east arm does when fishing the harbour side. the advantage of fishing here is that it is a little more sheltered and your car is only a few yards away so if the weather worsens you can jump in or pack up and head off quickly. I have caught plenty of Pout, Whiting, eels and Rockling here with best results being on a night tide. Only a gentle cast is needed. You can use a variety of rigs and shouldnt expect to lose too much gear unless you are unlucky. you may need a heavier weight though as at times the tide can run strongly. I would use a normal 2 or 3 hook flapper rig with long flowing snoods (20+ inches) as these should attract the fish and make the bait move more naturally. If you find that your bait is constantly being taken then there are probaly crabs about so you may want to try pop up or floating beads to get your baits just off the bottom. 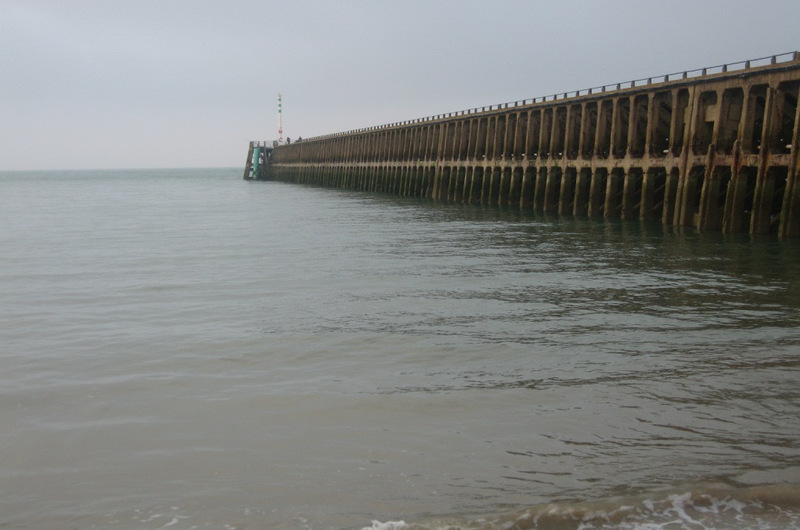 Picture: Newhaven east arm fishing into the river entrance.